by jbowen100.In Uncategorized.2 Comments on What Tools Are You Using for Your Leader Growth? What is the primary tool you use to learn and grow as a leader? How do you record key experiential lessons or ideas in the moment? Finally, how do you maintain them for long-term retention and use? I argue that every leader should define how they are learning and what tool(s) they use toward that effort. 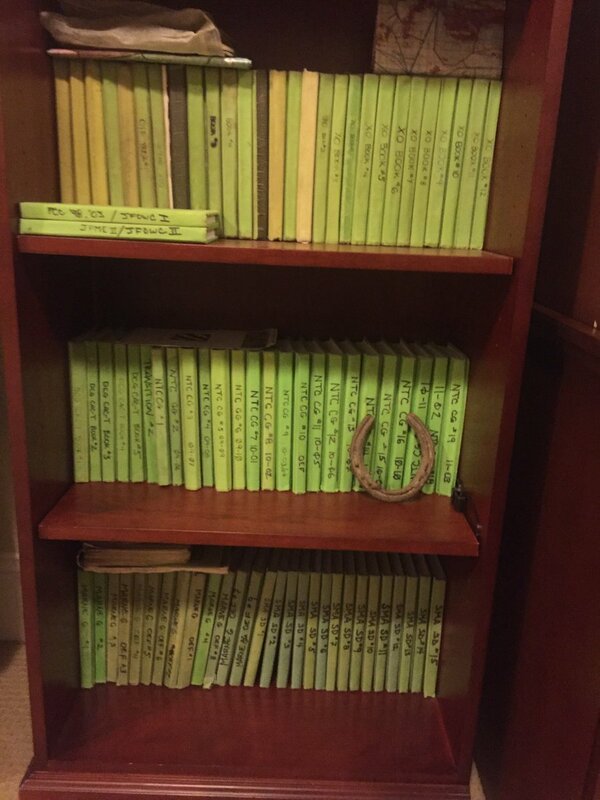 In his blog, From the Green Notebook, Joe Byerly clearly defines his learning tool as the famous Army green notebook. Here, on 3×5 Leadership, I identify mine as the common 3×5 index card. I believe there is an important message conveyed on the value of defined learning tools when leader development blogs such as these are named after the author’s tool of choice. After defining what their learning tool of choice is, I often see leaders struggle to make the next necessary step: to do something with the product. I don’t believe it’s terribly effective to keep a bookshelf of filled green notebooks that are likely untouched afterwards, or to keep a box full of hundreds of filled-out index cards somewhere on a shelf or closet. Further, like almost every Army leader, I too use a green notebook. However, it often becomes filled with daily urgent “to do” lists in addition to insightful leader lessons that I should remember years down the road. How do you separate those so the important lessons are not lost in the noise of the notebook daily tasks? To truly learn from the lessons you record, you need to make them easily accessible. I argue that you need to create a personal learning resource to centralize your valuable lessons. I centralize my leader lessons on my Dropbox application. I maintain a “reflection” folder on the app with a series of role-specific Word documents and/or folders in it. I keep a “TAC Preparation” folders for ideas to implement in my next duty position as a USMA Tactical Officer and to consolidate my preparation research. I also maintain a “Field Grade Ideas” document for ideas and lessons for my future field grade officer positions (battalion S3 or XO, etc. ), and a “master reflections journal” for any lessons that transcend specific roles. When I write an idea or lesson learned on my 3×5 card, I consolidate them at home and transcribe them onto the appropriate document to the future role it applies to. I keep the documents on Dropbox so I can access them anywhere and anytime, to include on my tablet and phone. I transfer both the idea or quote, as well as other relevant data pertaining to the thought (date, author of the quote, location, or any reference needed to make sense of it in the future). Adding context to the actual idea in your centralized notes can enrichen the thought later down the road. You can use other online platforms like Evernote, your Google Drive, or a physical notebook if you prefer. Ultimately, find a lessons-consolidating system and platform that will best support your learning and long-term retention, and that can be easily accessible for your lifestyle. If you’re like me, as I mentioned above, your notebooks (Army green, Moleskin, etc.) likely are unorganized and include inscriptions of both urgent issues that are no longer necessary as well as your valuable lessons important for future success. How do you separate them to make it an efficient system? I use a simple highlighter. I keep my green notebook in some form of tactical cover; I personally like this one. In the cover, I am able to keep a highlighter with my notebook at all times. When I do record an important lesson that I need to transfer to my Dropbox documents, I highlight it in the notebook as soon as I write it down. When my notebook is filled up, I sit down at my computer and transfer all highlighted items into their respective Dropbox document. The highlights make transfer easy, so I’m not trying to make sense of what I wrote or remember the original context; I know if it is highlighted, it is important. Finally, I’m able to keep my green Notebook in case I need it for the future, and to add it to my collection, which I hope looks like this one day. These ideas may be exactly what you need to improve your long-term learning as a leader or they may not resonate with you at all. Also, this is just one method to consider; there are other great arguments such as this one that argues to integrate all of your note-taking to better make cognitive connections. I challenge you to discover what works best for you and create a habit to improve your experiential learning. Ultimately, my intent on sharing these ideas is to inspire readers to create a deliberate system to support your learning. Leader development occurs daily, not in a day. It requires initiative on your behalf and cannot be a passive afterthought. I encourage you to find out what way you will best learn to ensure the leader you are years down the road is the best possible version. I encourage you to share other ideas or ways that you learn and retain lessons as a growing leader! I’d love to hear them.